NEW YORK, NY — Mark43, the leading cloud-based public safety software company, today announced that it will be integrating with RapidSOS to provide emergency communications centers with Next Generation 911 (NG911) call location tracking technology. More than 80% of 911 calls nationwide are made on cell phones, according to the National Emergency Number Association. However, most public safety agencies still rely on approximate locations from cell tower triangulation even when smartphone devices can provide exact GPS locations. 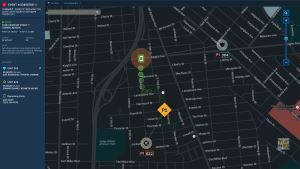 Using the RapidSOS NG911 Clearinghouse, Mark43’s Computer Aided Dispatch (CAD) will display precise location data for wireless callers, enabling call takers, dispatchers, and first responders to pinpoint the scene of an incident in real time. Mark43 CAD was purpose-built in the cloud and designed for quick and cost-effective interoperability with third-party systems and devices. The RapidSOS integration utilizes Mark43’s open API framework to seamlessly activate an additional layer of location data within the CAD’s existing map feature. Enhanced caller location data will increase situational awareness of active events, supplementing carrier-provided ALI data, agency-provided GIS and AVL information, as well as Google-integrated street and satellite views. Soon, this integration will be readily available to any Mark43 CAD customer. Mark43 is dedicated to continuously incorporating emerging technologies into its platform in order to ensure that first responders are using the best and newest possible tools to keep communities safe. In the future, it may be possible to further integrate today’s mobile technologies to streamline emergency communication and police services. One example of upcoming development plans is to leverage additional RapidSOS data, such as local traffic information from Waze. Attendees at the APCO International Annual Conference & Expo (August 5-8) in Las Vegas, Nevada can visit Mark43’s booth #443 to learn more. Mark43 is building the data engine that keeps your community safe. With the leading cloud-based public safety software platform, Mark43 makes access to reliable and actionable information a reality for first responders. Mark43 is trusted by dozens of police departments across the United States, spanning California, New Jersey, Oregon, Washington State, and the District of Columbia. For more information, visit www.mark43.com.